Nomads are born. While a lot of finger-pointing targets the home environment, there are many kids who are naturally drawn to the exit door. Born in Perth, Western Australia, Ruby Boots was happier with the exhausting work on pearling boats than life with her family by fourteen years old. 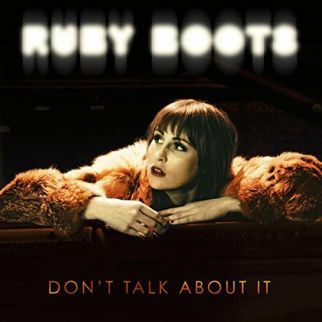 The road never stopped calling Ruby Boots, and the stories of her found treasures and lost highways are collected in her songs on the recent release, Don’t Talk About It. A chance meeting with The Texas Gentleman when the group stopped by Ruby’s new hometown of Nashville, Tennessee put the band’s Beau Bedford in the producer’s seat for Don’t Talk About It. 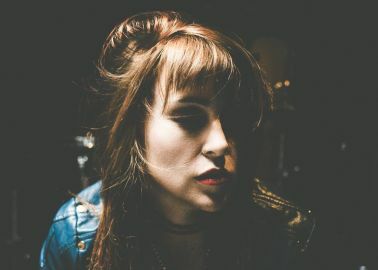 Recorded in Dallas, Texas at Modern Electric Sound Recording, the Roots of Ruby can be heard in Alt Country and Glam-tinged Southern Rock of her music and the echoed influence of 1980’s new wave and Indie Rock jangle of her songs. Opening the album with “It’s So Cruel”, Ruby Boots spits and snarls as she saunters into Don’t Talk About It on a T-Rex strut. She finds an “Easy Way Out” on a Country Rock groove, makes a one-more-chance plea on a dreamy melody with “Break My Heart Twice”, pulls resolve out of a jittery rhythm to promise “I’ll Make It Through”, and rails against the rumor mill on “Don’t Give a Damn”. The stories and musical backing breath different styles while Don’t Talk About It maintains a common ground of the twangy tease in the vocals of Ruby Boots and the mule-kick beat of the songs. A cornerstone of the album can be found in the cut “I Am a Woman”, Ruby feeling that the song ‘was conjured up amid recent events where men have spoken about, and treated women’s bodies, the way no man, or woman, should. This kind of treatment toward another human being makes every nerve in my body scream. These kinds of incidents are so ingrained in our culture and are swept under the carpet at every turn—it needs to change. As tempting as it was to just write an angry tirade I wanted to respond with integrity, so I sat with my feelings and this song emerged as a celebration of women and womanhood, of our strength and our vulnerability, all we encompass and our inner beauty, countering ignorance and vulgarity with honesty and pride and without being exclusionary to any man or woman. My hope is that we come together on this long drawn out journey. The song is the backbone to the album for me’. Don’t Talk About It strings a thick guitar line out over the graceful girl-group sway of the title track as Ruby Boots speaks of succumbing to “Infatuation” on the pound of a rock’n’roll beat.